To build an exposure map for an HRC-S observation and create an exposure-corrected image. Last Update: 30 Jan 2017 - Review for CIAO 4.9. Added note about maskfile and ardlib.par. dsHPEEVENTSEQERR -- WARNING: Out of sequence events discovered in /ciao/data/1038/secondary/hrcf01038_000N004_evt1.fits. are explained in the hrc_process_events caveats page. In this example, the script is only run on the central plate, since this particular observation does not contain data for plates 1 or 3. The location of the input event file is provided, and the supporting data filenames are read from the header. Since energy is not explicitly resolved in HRC observations, the center of the energy band is chosen at the user's discretion. Here, 1.1 keV is used. The result is the same as produced in the manual stages below (Figure 2). This thread creates an exposure map for the central plate (chip_id=2), although all three plates could be used (see the ACIS multiple chip thread for information on how to loop through all the plates). 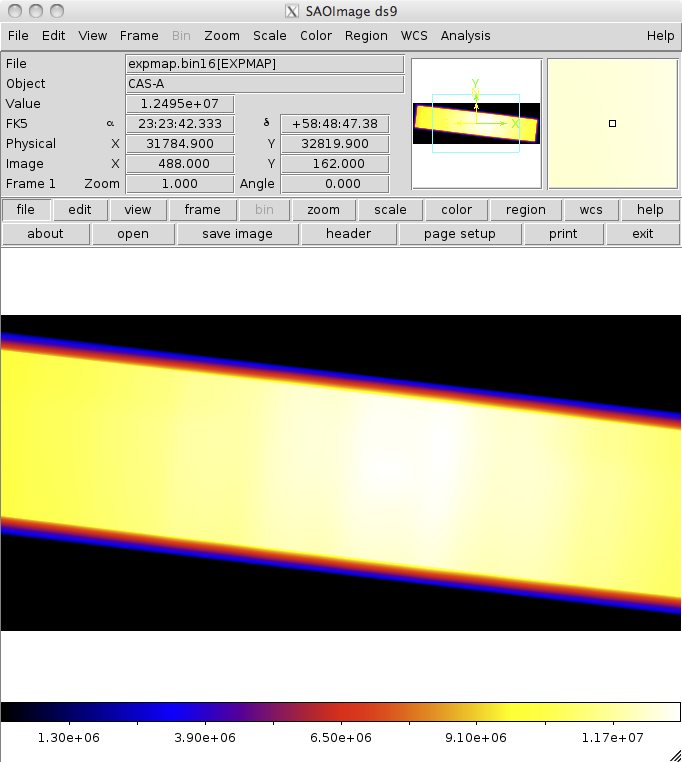 With aspect offsets file, we can create a binned histogram, detailing the aspect history of the observation. Only one aspect histogram needs to be computed because the three plates share a single GTI. Since the mirror effective area is used to create the instrument map, and that area is energy dependent, it is necessary to decide at what energy to perform the calculation (or whether to use a spectrum as weights). Since energy is not explicitly resolved in HRC observations, the monoenergy parameter is determined at the discretion of the observer (the default value is 1 keV); this thread uses a value of 1.1 keV. Note that it is not necessary for the instrument map to be congruent with the exposure map. 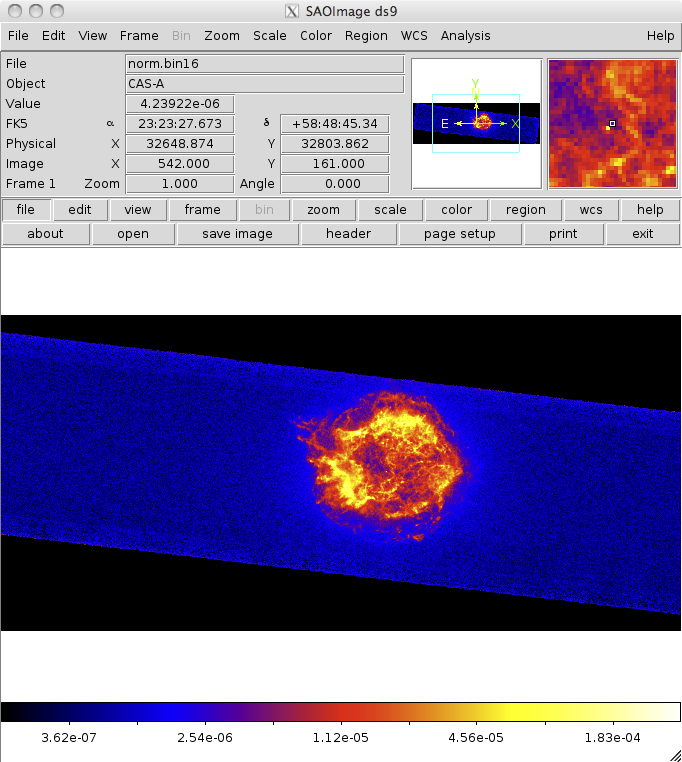 We set the pixelgrid parameter to cover the entire detector area and bin by a factor of 8. If you are computing a low-resolution exposure map and speed is more important than accuracy, set useavgaspect=yes. In doing so, only the average aspect pointing will be used to derive the exposure map; otherwise all points in the aspect histogram will be used. The time required to compute the exposure map is proportional to the number of bins in the aspect histogram; if the aspect histogram contains 100 bins, then the use of this option reduces the run time by a factor of 100, approximately (you may also want to set verbose to 2, since this causes mkexpmap to output percentage-completed information). 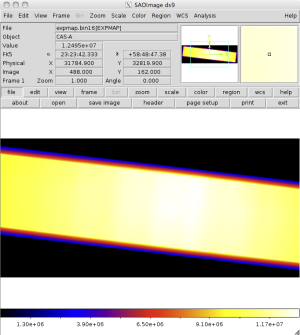 Using the full aspect solution will help accurately account for plate edges, bad pixels, etc. The units of norm.bin16 (Figure 2) are [photon/cm2/s/pixel]. 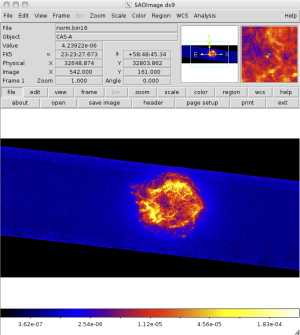 15 Oct 2012 The fluximage script has been updated in the 15 Oct 2012 scripts package: changes include an updated parameter file; output file names are different; and support for spectrally-weighted exposure maps. The observation used as an example has been changed to ObsId 1038, an observation of Cas A. 04 Dec 2013 Review for CIAO 4.6. No changes. 17 Dec 2013 Review for CIAO 4.7. Minor edits only. 30 Jan 2017 Review for CIAO 4.9. Added note about maskfile and ardlib.par.